Was there many in store at Brighton? Heated anyway. Curry's had a 128 gig air 2 for £240. When they checked the stock room the stock person asked how much and by magic it was no longer available. Heat added as you may be able to hold of these. It has a better screen but that it, we have 2 of the new 2017 ones and an air 2 and you can’t see much of a difference in performance but when you update them the 2017 update quicker. 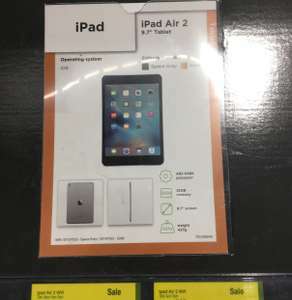 I reckon this is a good model to buy, the iPad Air1 has a slower processor and half the ram, and everything below that model is stuck on the old IOS. The iPad4 is a non buy for sure. Of course if you have more money then buy whatever. Buy the moon. The iPad2 is around £250+ on eBay, so if you'd rather buy from a store then you are not being stiffed by too much. Curry's had a 128 gig air 2 for £240. When they checked the stock room the …Curry's had a 128 gig air 2 for £240. When they checked the stock room the stock person asked how much and by magic it was no longer available. Heat added as you may be able to hold of these. By magic, that person might have changed his mind and decided to buy himself. You know human thing!!! For the WiFi only or 4G model? He is lying, you could not get even WiFi only for that money. I got in Canada when the exchange rate was Incredible it was 1 pound to 2 filler and I paid 659 dollars so do the maths! I got in Canada when the exchange rate was Incredible it was 1 pound to 2 …I got in Canada when the exchange rate was Incredible it was 1 pound to 2 filler and I paid 659 dollars so do the maths! How much was ticket to Canada? So I will do the maths. It's not better in terms of processing power but some people prefer the laminated screen of the Air 2. The construction or production qualities of the 2017 iPad, in terms of the lack of a laminated screen, aren't as good. Agreed. I got my 128gb WiFi new iPad 2017 for about £350 from very when they were doing 20% off apple products. It’s worked flawlessly and is very quick. Seen the iPad Air 2 screen and personally made no difference to me, but others will have different opinions I’m sure. i have the 2017, if you play clash of clans don't buy this one, the screen is useless. It doesn't register when you try and drop troops. Maybe similar in other games. For everything's else it's fine/good. After seeing how badly iOS 11 performs on a 1st gen iPad Air i would be reluctant to buy anything less powerful than the new iPad 2017. I know, I was just probing a bit further.